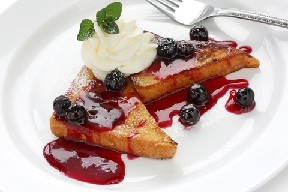 Blueberry Syrup Recipes! Top any pancake, waffle, ice cream or desert with one of these delicious recipes and it will instantly make it more decadent and healthy! Combine all ingredients and cook, stirring until thick. Serve warm. Yum, yum! Place sugar, spices and salt in a heavy saucepan. Dissolve cornstarch in 1 tablespoon water and add to saucepan. Heat to boiling, reduce to simmer and stir to smooth. Add blueberries and cook over moderate heat until smooth and thick, 20 to 30 minutes. Taste and add more sugar if needed. Add lemon juice only to taste; you may not want to use all of it. Add zest to taste. Serve warm or cold. HINT: Lemon zest is the bright yellow top layer of the skin. When grating, try to avoid the bitter pulp that lies beneath the zest. Combine ingredients in small saucepan. Crush berries with back of spoon. Simmer 2 to 3 minutes. Serve hot. Combine ingredients in small saucepan. Bring to a boil. Crush berries with back of spoon. Simmer 2 to 3 minutes. Serve hot.